RMS Queen Elizabeth 2, often referred to simply as the 'QE2', is a retired Cunard ocean liner, now owned by Nakheel, a division of Dubai World. She was named after the earlier Cunard liner RMS Queen Elizabeth (see Name section), and served as the flagship of the line from 1969 until succeeded by RMS Queen Mary 2 in 2004. Built in Clydebank, Scotland, she was considered the last of the great transatlantic ocean liners built for over four decades before the construction of the QM2. Before she was refitted with a diesel power plant in 1986, she was also the last oil-fired passenger steamship to cross the Atlantic in scheduled liner service. During almost 40 years of service, the QE2 travelled the world and latterly operated predominantly as a cruise ship, sailing out of Southampton, England. The city is deeply connected to the Cunard Line and their fleet of ships, which are the only passenger vessels to be registered in this city (and thus wear the name "Southampton" on the stern). The people of Southampton showed their strong connection with Cunard on 11 November 2008 when the Cunard Liner RMS Queen Elizabeth 2 which was built in Clydebank near Glasgow departed the city for the final time amid a spectacular fireworks display after a full day of celebrations. 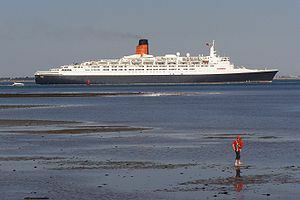 On 18 June 2007 it was announced that QE2 had been purchased by the Dubai investment company Istithmar for $100 million. Her final voyage from Southampton to Dubai began on 11 November 2008, arriving on 26 November in time for her official handover the following day. She was expected to be refurbished and berthed permanently at the Palm Jumeirah as a "a luxury floating hotel, retail, museum and entertainment destination." The refurbishment planned to see the QE2 transformed into a must-see tourist destination in Dubai, however due to the Global Economic Crisis QE2 has remained moored at Port Rashid awaiting a decision on her future.